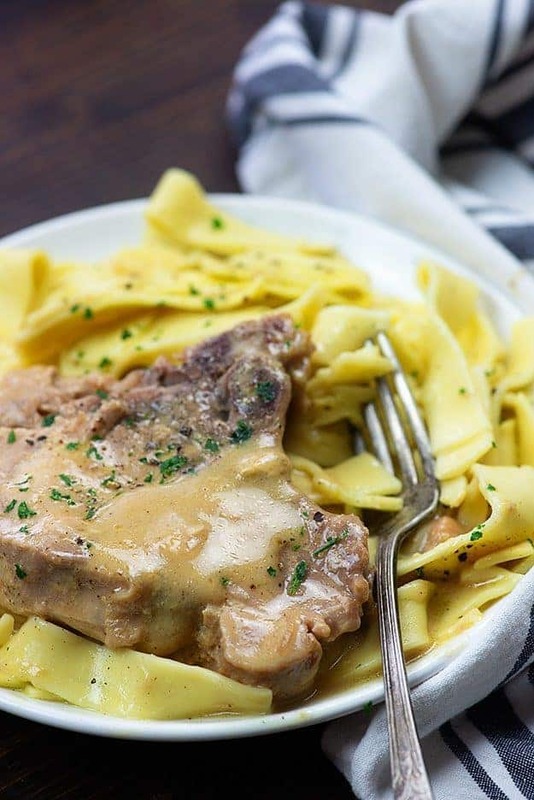 Smothered pork chops are a family favorite and this recipe is especially easy because it uses the crock pot. Serve over egg noodles or mashed potatoes! Up until about 3 months ago, I didn’t know what smothered pork chops were. I assumed they were full of mushrooms (and sometimes they totally are! ), so I avoided them like the plague. You guys didn’t know I was a mushroom hater, did you? I really want to like them. Honestly, I’m fairly certain that they even taste good – it’s just…I wouldn’t know. It’s a mind thing for me. Not a flavor thing. Like, they’re fungus? And that’s a big ol’ no as far as I’m concerned. Before you ask, yes, that also means blue cheese is out. Like, super out. Like, y’all. Just no. But, here’s the good news: I’m the boss of my life and that means I can make easy crockpot pork chops smothered in goodness without mushrooms. Being an adult is awesome. 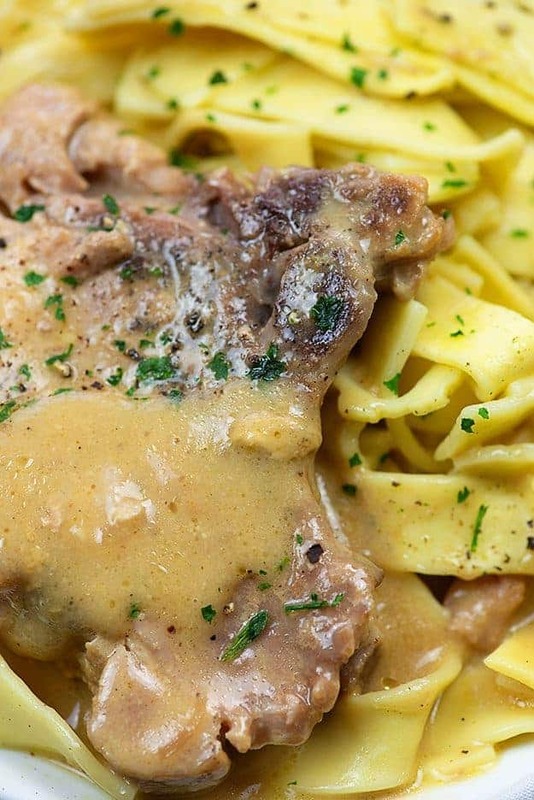 This smothered pork chops recipe is legit simple. The gravy makes itself right in the slow cooker with the pork chops so you basically just dump everything in there and then go live your life. I love recipes like that. Are you ready for this simple 5 ingredient recipe? All you’ll need is some bone-in pork chops, some onion soup mix, a couple cans of cream of chicken soup, chicken broth, and a little garlic. Mix together the cream of chicken soup with the onion soup mix, broth, and garlic. Spread that mixture into the bottom of a slow cooker. Pop your pork chops right on top and flip them around to coat them in the sauce. Cover and cook on high for about 3 hours or low for about 6 hours. 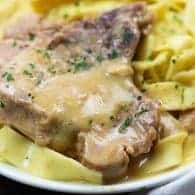 When the pork chops are cooked through, remove them from the slow cooker and then whisk together the gravy to bring it all together. Spoon the gravy over the pork chops and dig in! These are amazing with my buttered egg noodles (my kids beg for those noodles!) or some mashed potatoes (I normally cheat and use Bob Evan’s refrigerated mashed potatoes, because they’re sooooo good). 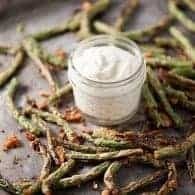 My green beans and bacon recipe is always a hit. These roasted vegetables go with everything. For dessert, I suggest my brownies or blackberry cobbler. The only thing you’ll really need for this recipe is your slow cooker! I have a bunch of them, but my favorite is the Ninja Slow Cooker. It has excellent reviews on Amazon, cooks evenly, and is really versatile as it has additional functions. Buy one here (affiliate link). 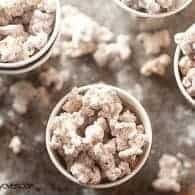 If you enjoy this recipe, be sure to follow me on Pinterest as well! I’m always pinning new family-friendly, quick, and easy meals like this! 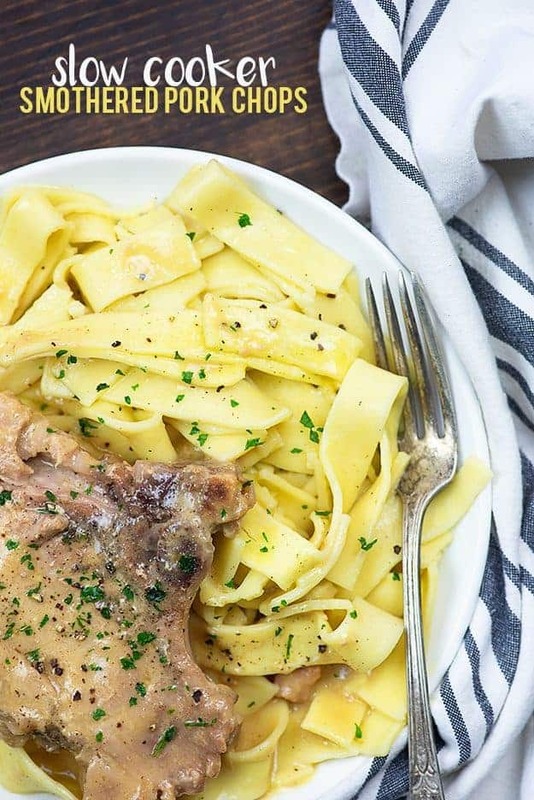 Smothered pork chops are a family favorite and this recipe is especially easy because everything cooks together in the crockpot. Serve over egg noodles or mashed potatoes! Add the cream of chicken soup, chicken broth, onion soup mix, and garlic to a slow cooker and stir well to combine. Place the pork chops in the slow cooker and toss to coat in the gravy. 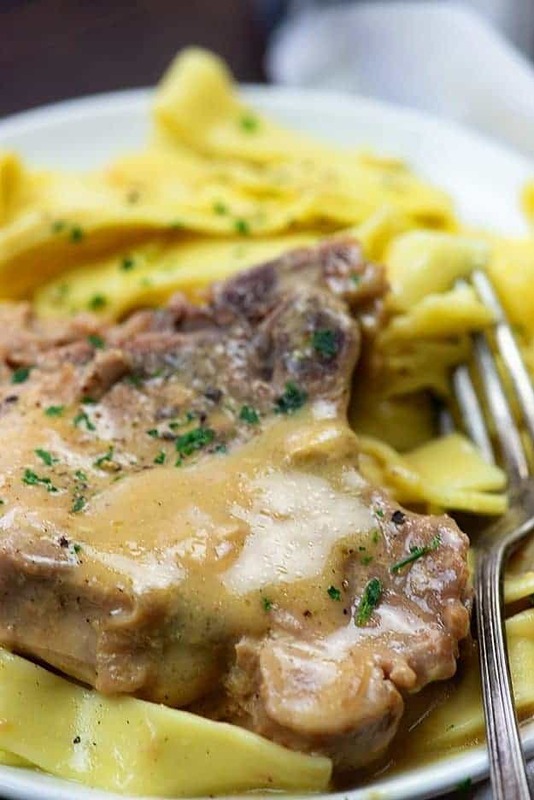 Remove pork chops from the slow cooker and whisk the gravy well. Spoon gravy over pork chops before serving. I have thick boneless chops (2). Do you think this recipe will work with my chops? Thank you for emailing me the recipe. Thank you for the quick reply ?. 21 Oz of soup? Sure it’s not 12? Yep, I’m sure! It’s two cans that are 10.5 ounces each. If condensed do you add milk or water? Any grocery store should carry egg noodles in the pasta section. Try the international aisle of your grocery store…German noodles are the best! Pork chops made this way is the best! Can you brown the pork chops before putting in the crockpot? What are we looking for when the pork chops are done? Tender? Fall apart? I like them very tender, but not quite falling apart. You can cook until they fall apart, if you prefer. My hubbie hates mushrooms also so I never use them in recipies! LOL!!! I don’t own a slow cooker. 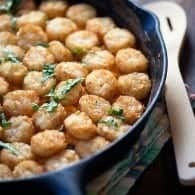 Could I make this recipe in a dish covered with foil and cooked in the oven? What temp and time would you think? I haven’t tried this one in the oven, so I’m not sure how well it’d work. I’d probably cook around 275, covered, for 3 hours or so. It may need more or less time, though. Yes you can. I do it often and even use different meats. Maybe cook it at 350 for an hour? Sound about right? Gravy was runny. I followed to the T. Or so I thought. What happened? Haven’t even eaten yet. Geez Louise. Hi Lisa! Sorry you weren’t happy with how this one turned out. The sauce is supposed to be a bit thin – did you watch the video attached to the post? Itp t shows the thickness of the gravy a bit better. If you wanted it thicker, you could leave out the chicken broth next time or try thickening it up on the stove with some cornstarch. If you turn the crockpot lid a little so the steam can escape for last 30 minutes or so of cooking, most gravies will thicken up nicely. Seems like water was added to soup! Should be just chicken broth correct me! I used a 26oz can of soup I found at Meijer. Gravy came out perfect, thicker than the first time I tried it. Yes, I would double everything. As long as your slow cooker is large enough, it should cook fine. I haven’t tried it, but I’d be a bit concerned that the gravy will burn if it adds much cook time. Yes you can use frozen pork chops! 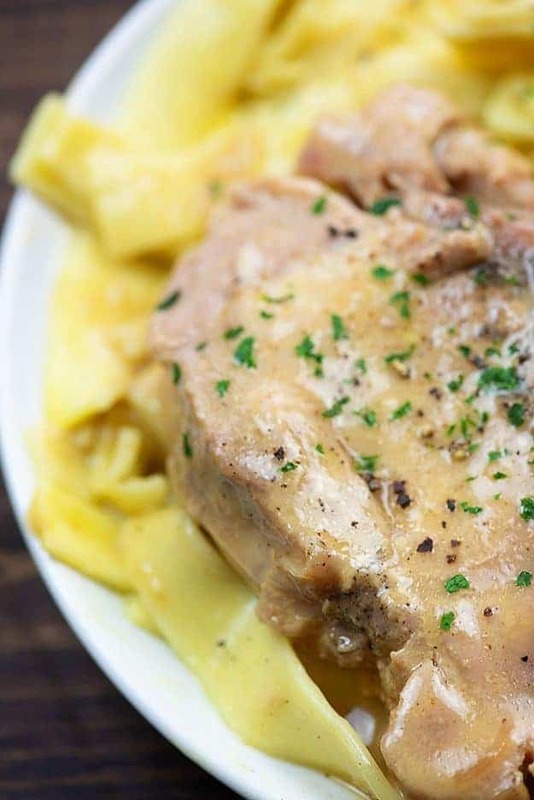 I came upon your recipe today for crock pot smothered pork chops so I did indeed make them. They were absolutely delicious! The chops were so tender & the gravy was so flavorful.cannot exclude how incredibly easy to put together. I added some sliced mushrooms & onions along with the original recipe . Thanks for sharing! Do you think you could add some cut up golden yukons to the crockpot? Hmm, probbaly! I haven’t tried it but I bet it’d work great! we used a little flour to thichen the gravy up perfect!!! Loved the recipe. Simple but tasty. Instead of 2 cans of cream of chicken though, I only put 1 and it was perfect. We ended up serving it over rice for my husband and spaghetti for me and it tasted great! Made this with 5 thick, boneless pork chops. It was really delicious. I took the chops out to a platter and covered with foil to keep them warm, then I turned the crock pot to “high” for about 10 minutes to help thicken the gravy. Will definitely be making this again. Thanks for the recipe! love! BUT the sodium content is a bit much! You can use reduced sodium cream of chicken or try making your own to help reduce it a bit. Could I add veg to slow cooker if so what would you recommend carrots onion potato ? I haven’t tried adding anything else in with this. It should work fine, though it will likely change the flavor of the gravy and make it more runny due to the liquid the vegetables release as they cook. Yet another food blog with waaay too many photos. Also, I see Sodium 2048mg. That is a nearly lethal dose of sodium for *anyone*, let alone those on a sodium-restricted diet. Sorry, no sale. Fritz: That’s what tends to happen when recipes have canned soup, onion soup “mix” and chicken broth….all 3 very high in sodium. If u don’t care for a recipe or a website then don’t use it. No need to spread your negativity. 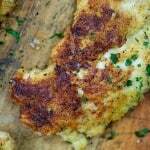 Best chops , my family raved about…..and my friends want the recipe…………..
Could I substitute chicken thighs – how long to cook if I do. I’m sure you could. I would guess the cook time would be about the same. I’ve made it numerous times with boneless chicken breast. Same cook time turned out great! Made this for dinner tonight, and my wife loved it! Can’t wait for your next recipe. Can I had rice to this while cooking? 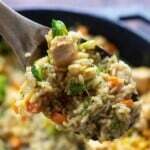 You would probably need to add additional liquid and time it so that the rice and pork were done at the same time. I haven’t experimented with this myself. LOL I can totally agree with you on mushrooms and blue cheese. You are not alone! Oysters are in their too!! Something that slimy doesn’t need to be in my mouth! I am trying this for tonight’s dinner. Looks and smells really yummy already and just started it lol. Hope it will come out well. My man loves anything pork!! Thank you for this recipe. I think when I make again I may try cream of mushroom soup in place of the cream of chicken soup and add 1/2 cup of beef broth with the onion soup mix and maybe add some mushrooms too. Don’t mean to tweak your recipe but a do that sometimes to switch things up. Thank you for this recipe, was a life saver today. Penny, I have made pork chops with cream of mushroom and golden mushroom (no onion soup mix though) both are wonderful. I get more raves with the golden mushroom. Karly- is it the texture of the mushrooms? You might try golden mushroom soup, the flavor is great and the mushroom pieces are big so you can pick them out, or strain with a slotted spoon. They are slices, not pieces like in the white soup. And it tastes nothing like mushrooms. This is so lame of me, but it’s the IDEA of mushrooms. They’re fungus. Ew. (Sometimes I’m such a child.) 😉 Thanks for the tip though! This recipe…. is… AMAZING!!!!! I cannot stop eating it! The noodles topped with the pork chops and gravy is fire! So so good! I made this recipe for dinner tonight, and everyone loved it. 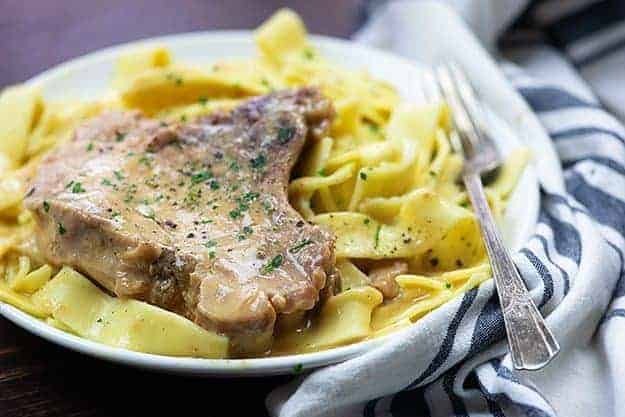 One thing I will probably do differently next time is use boneless pork chops because, although it was great that the meat was so tender that it fell off the bone, we had little bone pieces we had to watch out for in the gravy. I’ll probably also use the low sodium version of the cream of chicken soup since my husband has to reduce the sodium in his diet. Thank you for sharing your recipe! I love the sound of this recipe but my head is already screaming about the migraine from all the MSG. I used to make something similar for my daughter but she has migraines now too. Do you have any suggestions for substitutes for the cream soup and the onion soup mix? Add one package of ranch seasoning dry mix. Also no need to double above suggestions to double the amount of pork chops! Cream of celery condensed soup is amazing with any kind of smothered pork! My pork chops are in the crockpot now! I browned boneless chops first, used one can cream of chicken with one can of milk in addition to the onion soup mix and fresh garlic. Using milk instead of chicken broth reduces sodium. Smells soon good! Recipe is amazing! Flavor is amazing! But don’t use bone in pork chops. Boneless will be just as good. Another great recipe! Second one I have tried. It keeps really well. I know it says only 3 hours but I put my stuff in when I go to bed so it is ready in the morning and there is was all beautiful in the morning. Thanks! I thought about smothered pork chops too late, and then found your recipe and thought this should be easy enough. But then like I always do, I started with the recipe, and then, started adding stuff (usually based on what I have in the refrigerator). First, I used a large can of cream of chicken soup, so I decided to use up the extra soup in the crock pot with cut potatoes. So, I threw a bunch of them in (didn’t have egg noodles; I used them the other night). I tasted the sauce and it was a little salty, so I decided it needed a “kick” and added some Sriracha Hot Chili Sauce. Then it was too hot to notice the salt! Then I read some of the reviews about mushrooms (all I had was cream of mushroom soup and I didn’t need that with cream of chicken soup, but mushrooms would have been good). But then someone mentioned celery. Well, I had two whole heads of celery and don’t eat it raw (or cooked), so I cut up a bunch of celery and threw it in. It’s cooking now. I’ll let you know if I screwed up your recipe (but I got rid of a lot of extra celery :}) P. S., I may need to add water or chicken broth…the crock pot is pretty full. Hi I just bought the ingredients and will be making today….I wanted to know can I a add pork gravy pack to make my gravy thicker or will that be to much? I haven’t tried it, so I really can’t say how it’d turn out. Maybe add more broth if you do so.